Coffee, Our Town, or Me? I’ve just finished the final read-through of my column for December’s issue of Our Town Magazine (HI-larious, trust me). When it suddenly occurred to me that I haven’t yet told the tale of how a newbie writer (That’s me, playing the lead in the story) happened to catch her big break (That would be the column, for those following the story line). It was a dark and stormy night when Mr. Hall went out to get a cup of coffee. (All good stories start like that…though, in actual fact, it may have been a bright and sunny morning). Anyway, the beneficent Mr. Hall, at some point in the coffee pursuit, crossed paths with a friend of mine. We shall call her Madame X (though, in actual fact, her name is Janet Lennox). 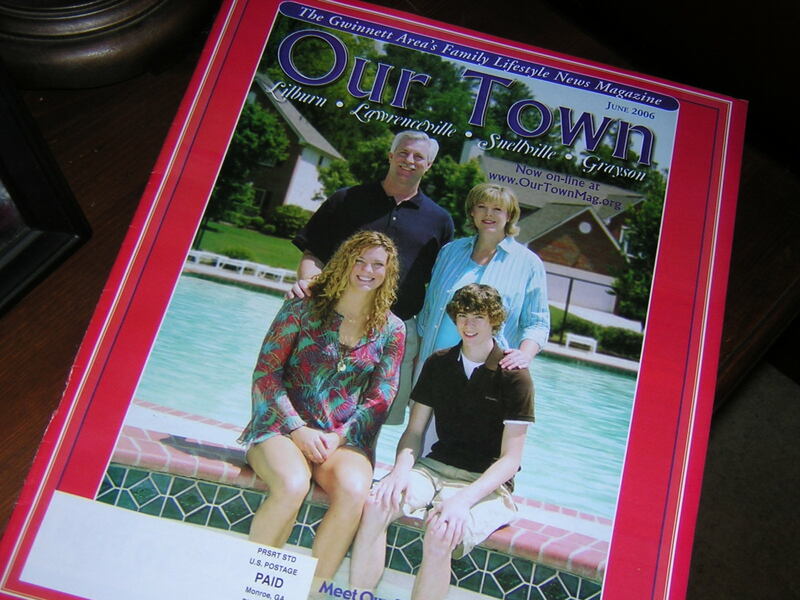 As fate would have it, Madame X was in possession of several copies of Our Town Magazine (the plot thickens!). Chit chat ensued. Mr. Hall talks like that when he is out amongst the public. Odd, I know, but Madame X talks like that in public, too. So, (end of story) I write a funny column called Inside Out for Our Town Magazine, wherein I reap a bit of Fame and a smidge of Fortune. Oh, look! A visual aid for the story: Copy of Our Town Magazine in which my first comic musings can be found. Bonus: Name the Olympic swimmer on the cover.